We feature lots of destination weddings, sometimes the couple live in the country already, but for the most part, the couple planning the wedding are based here in the UK. It can be really easy to get carried away with the fun of planning a destination wedding – the sunshine, the cocktails, dining under the stars, but with destination wedding planning comes an extra level of detail you’ll need to make sure you’ve covered. What exactly does getting married abroad in Spain look like? Elizabeth: Spain is a beautiful country that enjoys an average of over 300 days of sunshine each year. 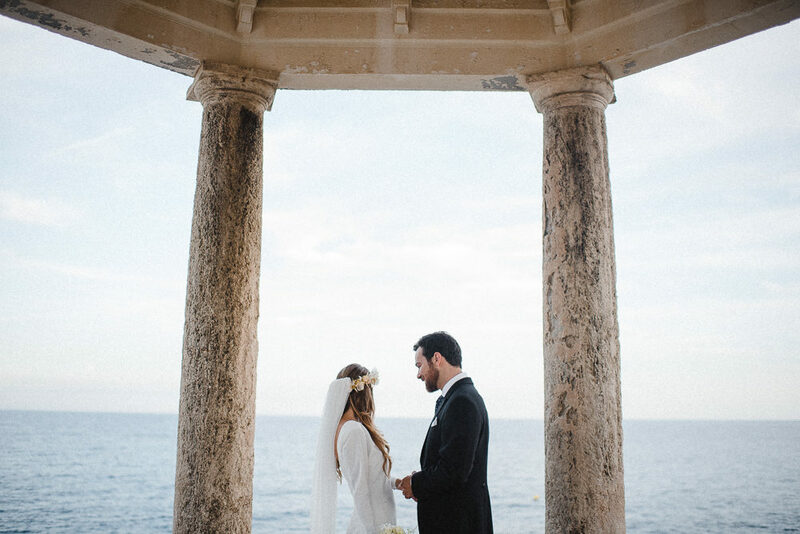 It has been deemed one of the sunniest countries in Europe and this is one reason that foreign couples love to have their destination wedding celebrations in Spain. (The sunshine along with the amazing cuisine of course)! But what about the legalities of getting married in Spain for foreign couples? The legal side of hosting a destination wedding in Spain can be a bit tricky. This post addresses everything you need to know about getting married in one of the most beautiful countries in Europe. If you or your partner is Catholic the good news is that your wedding can be recognised as legal in Spain. The process can be lengthy but not impossible. Catholic weddings are the only legally recognised religious wedding ceremonies in Spain. In fact, a Catholic wedding is the only way to be legally married in Spain if neither you nor your partner is a Spanish citizen. Those intending to have a Catholic marriage ceremony in Spain need to allow at least six months for all the documentary requirements to be met. At least one partner in the couple has to be Catholic and neither can be divorced. Although Catholics of any nationality can wed in Spain, they need first to contact their local priest and discuss their desire to marry abroad. Paperwork needs to be completed at home, usually through the bride’s parish but certain documents such as the groom’s baptismal certificate will be required. The priest will get in touch with the parish in Spain and will guide you through the paperwork. Forms and documents need to be translated into Spanish. Pre-nuptial enquiry form for each party to the marriage (can be obtained from your local parish). Baptismal certificates for each party, issued from the parish of your baptism and dated within six months prior to your wedding. I.e. if your wedding is in May the date on your certificate must be within the six months prior to this (December of the previous year – May of your wedding). Confirmation certificate issued from the parish of your confirmation and dated within six months prior to your wedding. Permission from both your Parish Priests to say that you may be married outside your own parish). Letter of Freedom to Marry. A formal letter from your parish priest that states that you have fulfilled your Pre – Marital course requirements. This letter should also include permission from the priest that you are free to marry in a Catholic Church elsewhere. The priest will forward this on to the local Archbishop who will prepare a cover letter. Along with the rest of the items listed above, your priest or Archbishop will forward these documents on to the local bishop in Spain (see next point) who in turn will let the church you are to be married in know that everything is in order. If you take a marriage course required by the priest YOU ARE NOT REQUIRED TO BRING PROOF OF THIS TO SPAIN. If one of the two people intending to marry is not a Catholic, then the home Bishopric must also issue a Dispensation to accompany the paperwork. Once you and your priest have completed these documents he will send them off to the Archbishop in your area. From here they will be sent on the Archbishop of the diocese in Spain where you will get married. The Archbishop’s office will check your documents and send them on to the parish where your wedding will be held. They will arrive approximately one month before your wedding if all paperwork has been completed on time. Very Important: Wedding dates need to be organized directly with the church in Spain. After the wedding, you must deliver the marriage papers to the local Spanish Civil Registry to legalise them. You can have a blessing but the paperwork will have to be sorted out at home. Unfortunately, you can only be married legally in Protestant, Islamic and Jewish ceremonies if you can meet the 2 year residency requirements. Normally couples who are from a religion other than Catholic choose to have a blessing ceremony. This route can be much easier and most couples decide to hold their blessing in Spain and deal with the paperwork when they return to their home country. If you are prepared to get married in a civil ceremony at home first, then you can arrange to have a religious blessing in the church of your faith here in Spain. Planning a destination wedding can be enough stress on its own and dealing with the extra paper work can make things even more difficult. A blessing ceremony is a ceremony that is the same as a legal wedding ceremony, the only difference is that it is not recognised as legal. This is why we think it’s a great idea to have a blessing ceremony with an officiant (that’s what I did). This way you get to have an official looking ceremony, which you can even help to design or write, and your guests are none the wiser that it’s not the real thing! After our wedding and reception in Spain we then went back to the UK and has a small registry wedding in my home town of Aylesbury! If you would like any more information on this subject, just get in touch with the experts at Spain For Weddings: The Spanish Wedding Network. And for Spanish wedding suppliers handpicked by team RMW, please visit our supplier directory The List, or browse the real wedding pages on our site. Big thanks to Elizabeth at Spain 4 Weddings for her help on this article, if you’re getting married in Spain we’re jealous!